My little Chyna and I had fun yesterday setting up new displays and getting ready for our big party this Friday night! She's only 9 years old and has such a natural sense of design. 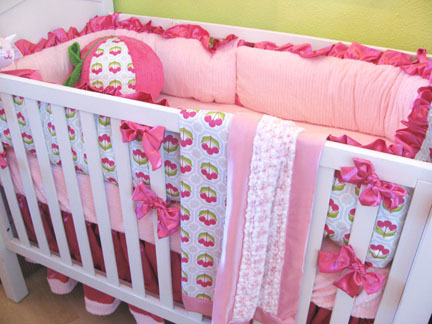 This is my new crib set I designed with my Cherry fabric. I love the way this rolly polly Cherry Pillow came out! There are still 2 days left to "comment" and be entered to win! I'll be picking the winners this Friday! Party starts at 5:00 pm. I hope to see you there!